Join over 10,000 stores who trust our plugins — Quick View Pro is perfect for restaurants, photography, fashion, wholesale and more. Customers browse your store and view any product in a Quick View lightbox, without visiting the single product page. The quick and easy way to grow your sales. Design a Quick View to suit your store. Customize the buttons, links, layouts, and lightbox content. It's the most advanced WooCommerce Quick View available today. Supports all product types including variable products, external/affiliate, and grouped. More third party integrations than any other WooCommerce Quick View plugin. Plus you'll save time with a robust, high-quality solution built by WooCommerce Experts. Help customers quickly browse large quantities of information: a better purchase experience to increase sales. Use it alone to add Quick View to your shop and category pages; or use WooCommerce Product Table and Quick View together. Add to cart and immediately return to product listings for another purchase. Or if you prefer, direct customers straight to the cart. 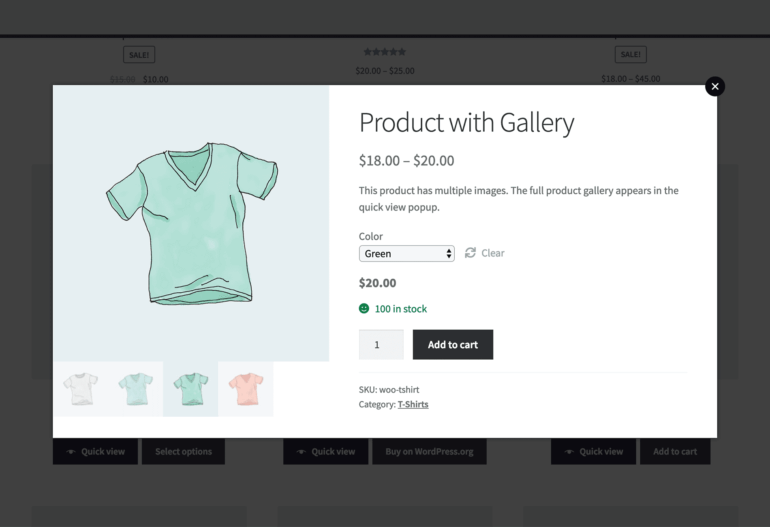 Create WooCommerce a product gallery lightbox, with multiple images in the Quick View - complete with zoom feature. Built for ease of use and setup, no code required. Choose a few settings, hit save, and you're done! Supports all built-in product types - simple, variable, external/affiliate, virtual, downloadable, and grouped products. Take your store to another level by using Quick View with Product Tables, Add-Ons, Bundles, Subscriptions, WPML, and more. The plugin comes with a detailed knowledge base, tutorials and expert support from UK WordPress agency Barn2 Media (est. 2009). Sell complex products more quickly - customers can choose variations and Add-Ons directly from the Quick View lightbox. Change the button text, add an icon, and choose whether to open Quick View via a button or the product name/image. 3 layout options (images, product details, or both) - plus full control over which product information to include in the lightbox. The WooCommerce Quick View buttons and lightbox adjust seamlessly and adapt to fit any screen size or mobile device. Rated 5 out of 5 stars based on 5 customer reviews. This plugin was a great addition to the product table plugin. It works very well and the support was super useful. Barn2 not only make fantastic plugins but the customer service is second to none. The only thing better than a dependable product is dependable customer service – and they have that, too. There's a reason the biggest retailers use quick views — the easier it is for customers to buy, the more you sell and the more you convert. Which product details can I display in the Quick View lightbox? You can choose from reviews, price, the short description, add to cart button, and meta information such as categories, tags, and SKU. If you have product variations or add-ons then these will appear too. What are the three layout options? You can choose from image only, product details only, or both. 'Image only' is equivalent to the top left side of the single product page and shows the product image and gallery. 'Product details only' is equivalent to the top right side of the single product page. 'Both' displays a column layout (which stacks vertically on mobiles). How can I customize the Quick View button? You can customize the text and replace the default 'Quick View' wording with custom text. You can also choose whether the Quick View opens when you click the product name or image, or whether a button shows alongside your Add to Cart button. There's also an option to show or hide an eye icon in the button. Can I show a product gallery in the Quick View lightbox? Yes! You can show one product image, or if your product has several images then the full product gallery is displayed. Choose between clickable thumbnails under the main image, or bullet navigation links. You can also choose whether to have zoom enabled when you hover over the product image in the Quick View lightbox. Which WooCommerce product types are supported? WooCommerce Quick View Pro supports all built-in product types: simple products, variable products, grouped products, external/affiliate products, virtual and downloadable. Yes! WooCommerce Quick View Pro is designed to work with any WordPress theme. This includes major themes like Avada, Flatsome, X, Betheme and Divi, plus any other theme. The Quick View lightbox inherits the styling from your theme, so it will fit beautifully with the design of your site. Which other WooCommerce plugins can I use it with? WooCommerce Quick View Pro has official integrations with WooCommerce Product Table, the official Product Add-Ons, WooCommerce Product Bundles, Composite Products, WooCommerce Deposits, WooCommerce Subscriptions, and many more. You can read the full list on our compatibility page. All of them! WooCommerce Quick View Pro is officially certified as 100% WPML compatible, so you can translate into any language. It also supports right-to-left (RTL) languages. If you're not satisfied with your purchase for any reason, get in touch within 30 days and we'll issue a full refund. These screenshots show some of the different uses of our lightbox plugin - WooCommerce Quick View Pro. The exact styling will depend on your theme. 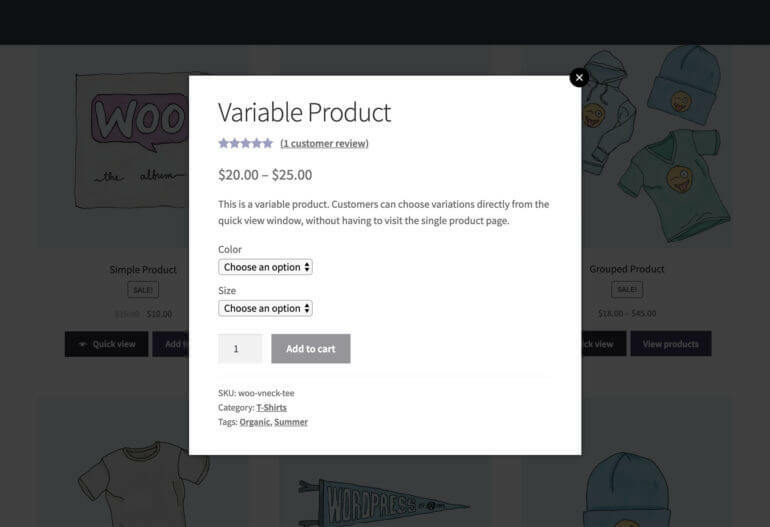 Add customizable Quick View buttons to the WooCommerce shop and category pages. The Quick View also appears for related products, upsells and cross-sells. Customize the Quick View links and lightbox content on the plugin settings page. 2 gallery styles for multiple product images - bullet navigation or thumbnails. The WooCommerce Quick View supports embedded audio and video players. You can control which information appears in the WooCommerce Quick View lightbox. Sell extra options by using Quick View with the official Product Add-Ons plugin. 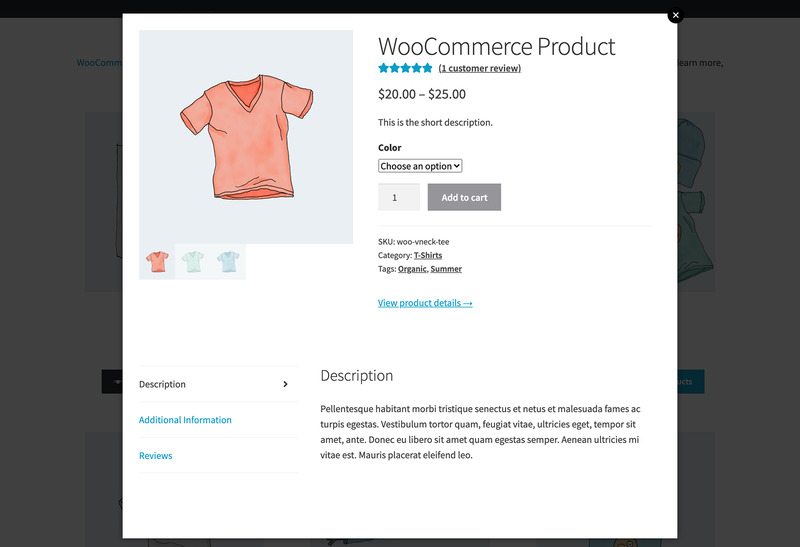 Supports all built-in WooCommerce product types, including grouped products. 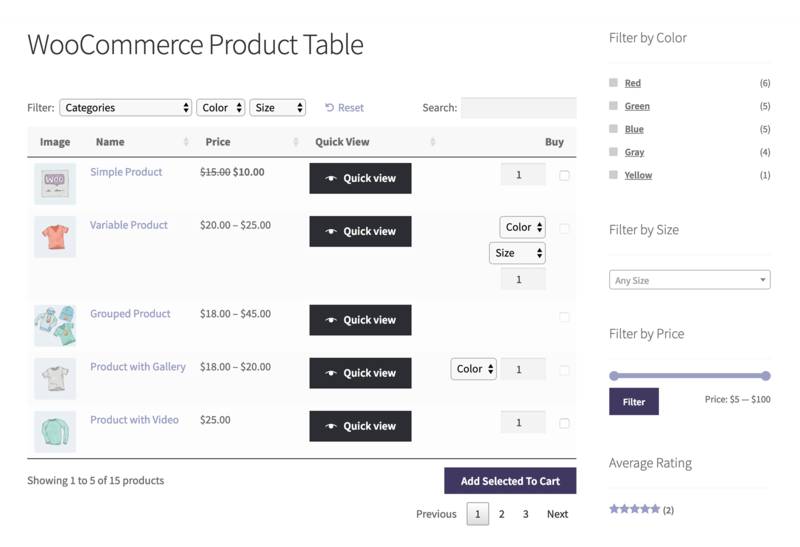 Get WooCommerce Product Table today and start making more sales! Fix: Bug adding variable products when attribute names contain non-Latin characters. Fix: Set nonce header for add to cart REST request to ensure proper authentication.